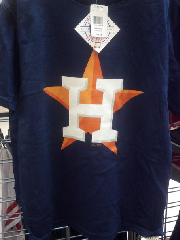 Academy Sports, who has a partnership with the Houston Astros, had a bit of a whoopsie moment when they accidentally put out 'Stros shirts bearing the new logo that the team will be using in 2013. The new gear wasn't supposed to be unveiled until November 2nd. Whoops. The seventeen die hard Astros fans that heard about the mistake, before the clothing was yanked from the racks, rushed out to get their hands on the items. The shirts could essentially be considered throwback gear since the "new" logo is simply a revamping of the classic "H" with a star background. Most baseball fans were puzzled as to why people would be so anxious to get their hands on merchandise representing a AAA team. Turns out, the Astros are still a Major League team. With uniforms and everything. Crazy, I know. I guess consecutive 100+ loss seasons doesn't get you kicked out of the big leagues. And it's not as if things are going to get any easier for the team formerly known as the Colt 45's. Next year they join the AL West, a division whose third place team would've won the AL Central. Have fun with that Houston. "We express our apologies to Houston Astros fans, our partners at the Houston Astros ball club, along with Major League Baseball for inadvertently releasing the new Astros t-shirts in limited quantity," says Rodney Faldyn, Academy Sports + Outdoors CEO & President. "We take pride in our ongoing partnership with the Astros, and this oversight is not our standard business practice. We are looking forward to celebrating the official jersey launch with the Houston Astros on November 2, 2012." Isn't that sweet. Of course after they made a few bucks they were sorry. Doesn't really matter though, rarely does a new logo mean a team is going to be good. What's that? The Angels changed their logo going into 2002, ditching the periwinkle blue for the red and went on to win a World Series that year......Good thing there is plenty of room on the Houston Astros Radio Flyer bandwagon. Until then, I'm going to keep posting this video in anything Astros related. 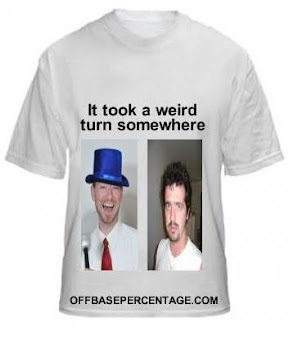 Jack Morris, Pitch Counts and, Warm Fuzzies?